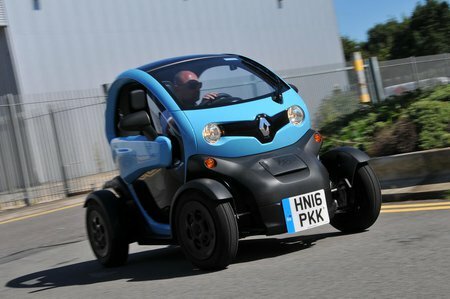 Renault Twizy Running Costs, MPG, Economy, Reliability, Safety | What Car? The Twizy is much cheaper than ‘proper’ electric cars, such as the Renault Zoe and Nissan Leaf. The asking price is particularly tempting, although you do need to factor in an extra monthly fee to lease the battery pack from Renault – there’s no option to buy it outright. Running costs will also be tiny, because you won’t pay a penny in road tax and the impact on your electricity bills will be far smaller than what you'd pay to fuel a conventional petrol or diesel car. Insurance costs aren’t as cheap as you might imagine though, no doubt in part due to the Twizy’s woeful two-star Euro NCAP safety rating. Standard equipment is very basic. Forget air conditioning – you don’t even get doors. However, you do get a driver’s airbag and, if you go for range-topping Dynamique trim, alloy wheels. There are plenty of funky colour combinations to choose from and Renault will even wrap your Twizy in a Union Jack or leopard print if you fork out a sizeable fee. Options include scissor doors, a basic Bluetooth system, an anti-lift alarm and a clear roof, while plastic windows are available as a dealer-fit accessory. Annoyingly, you can only plug the Twizy in using a three-pin domestic plug, which means you can’t charge it at many electric car charging stations. However, Symphony EV sells a clever adapter to get round this problem.